The first page I've done, may still be work in progress. At the moment I'm not adding text, just want to get a feel for the flow of the book and see how it develops. I'm trying to use the paper this time and keep a sketchbook feel to it, the paper doesn't let you manipulate the paint as much as watercolour paper and crinkles with the paint but a challenge is always good. 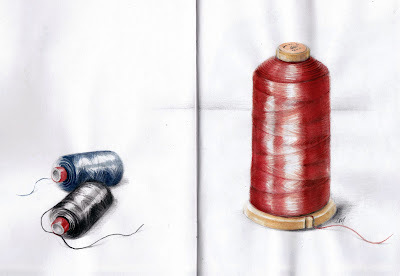 I think I remember from previous posts that I am mightily impressed with your cotton-drawing skills. For some reason, the crinkling of the paper works. To me it looks as if the reel has actually been dropped on the page which has buckled under the weight. Blimey...yes, Bella is right. It does look like the cotton has been placed on the paper. But also looks like it is stood up on a table so two ways of looking at the same great drawing/painting. I remember these rolls of threads my mom used to have in her little drawer for any minor repairs she needed to do for our clothes. I don't think she does that anymore because her eyesight has deteriotated.